Understanding how the diaphragm works in regards to breathing and singing is one of the most difficult concepts for many singers to grasp, since the diaphragm has no nerve endings and we really don’t have direct conscious control of it’s action. 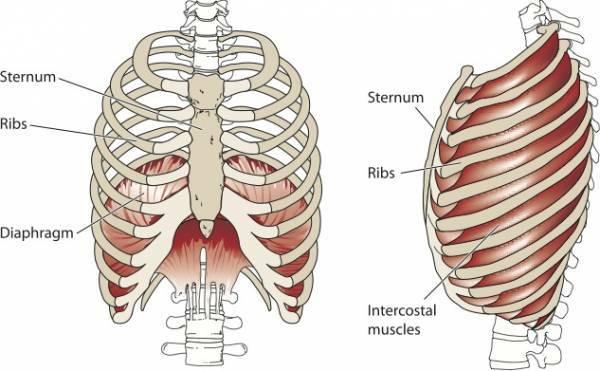 Breathing in and out is a mechanical process involving filling the lungs using the diaphragm (and intercostal muscles between the ribs to open up) and exhaling the air, using the abdominal muscles. It’s actually a cycle, where the inhale and exhale are intrinsically connected, which adds to the mystery of this process. In typical deep breathing as shown above, the diaphragm immediately relaxes as the abs pull in. When singing, however, we strive to control a slow exhale by keeping our ribs extended throughout the exhale, which keeps the diaphragm engaged and our singing voice energized. The action of the diaphragm is like the wind, we can see and feel the results of it’s movement but we can’t really see it. When singers learn to feel the opening up in the ribs on the inhale and the strength and flex in the ribs while singing, along with the solar plexus area, they are building the breath awareness and control needed to sing well. While singing ease and consistency is really a feeling, great 3D visuals like those on this page really help achieve that goal. Enjoy!